If you want to make pizza at home instead of take-out delivery pizza it’s easy, tasty and won’t break the budget. Pizza Delivery is still a big phenomenon around the world especially when it comes to parties, gatherings, weddings, or just treat night for the family. These shops make it even easier for the average consumer who has internet access as you can now order pizza online without having to make a phone call. The easier they make the process the less hassle you will believe it is. Making homemade pizza does take a bit of time but if you plan ahead you can easily make the perfect pizza crust and a good Italian pizza sauce. After all the history of pizza also known as a pie points in the general direction of the Italians towards Naples, Italy. Pizza is pronounced “pittsa” which is funny because we have heard Italians pronounce it that way.Unlike Canadians, Italians savour their pizza like a small snack and don’t particularly eat it as a meal. Great thing is you don’t have to be Italian to make an Italian Pizza recipe. I will always say the best pizza is a stone oven baked pizza although most Canadians don’t have a stone oven in our outside their home. How do you make pizza then you ask? Well it’s fairly simple and pizza made at home is better than those frozen pizzas that you buy at the grocery shop. 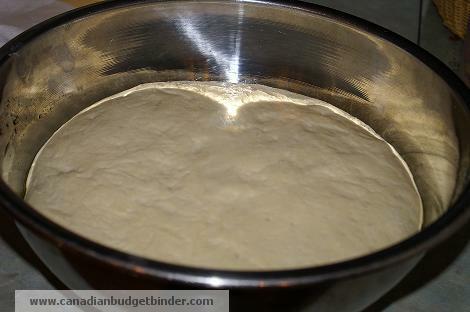 A good pizza base recipe ( the crust) which is the bottom of the pizza, in my opinion needs yeast although some people prefer their pizza dough without yeast. No yeast will prevent the crust from rising like proper yeast dough but if you like a flat bread type pizza this might be the way to go. I would find it similar to my spinach tortillas which are yeast free and you could easily put any pizza toppings on it and stick it in the oven. You can use either bread flour (which will give you a crispier crust) or the all-purpose flour (which will give you a chewier crust) pizza. For this recipe I chose to go with an all-purpose flour as I prefer the chewier crust. When I created this pizza base I tinkered around with eggs, no eggs but found that adding an egg to the pizza dough made it easier for me to roll. No, I didn’t do any fancy pizza tossing with this recipe as I’m afraid I would only make a disaster. It was hard for me to come up with one pizza as I had pizza topping idea flowing through my head non-stop. I ended up with a simple pepperoni, mushroom, onion, cheese pizza with cornmeal sprinkled on the bottom for texture. It took about an hour for the dough to rise and after that it was smooth sailing. You can also add herbs and garlic to your dough if you like to jazz up the taste even more. With the leftover dough I rolled it out and made calzones because I didn’t want to waste anything. The best pizza sauce we like is the sauce that we make for pasta. We like the tanginess with the use of tomato paste and all the staple fresh ingredients of a good Italian pasta sauce. Pasta sauce is so easy to make that you can’t even compare homemade sauce to anything you buy in a can or a jar. 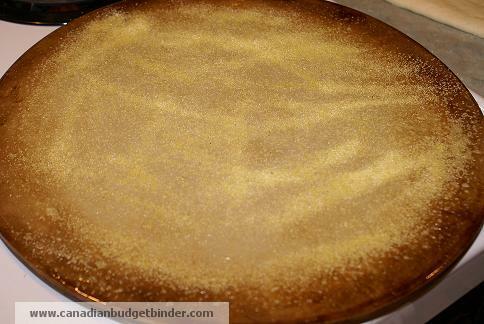 We have a pizza stone which I put in the oven to get nice and hot then topped it with cornmeal. 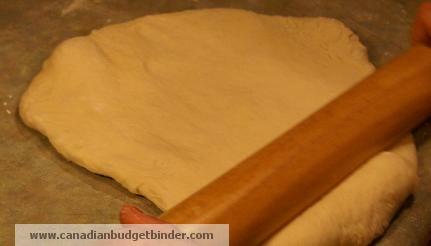 I then put the pizza dough that I rolled out on the pizza stone so I could add my toppings. I could have created a deep-dish Chicago style pizza but I wanted to keep it light as I find deep dish pies to be heavy especially if the crust is stuffed with more cheese. If you have the option to get a good mozzarella and provolone cheese I would suggest that. Pizza Sauce– Recipe for homemade pizza sauce (Use the sauce recipe at this link but you may want to make it a day in advance due to the time required. This recipe will make more than you will need so you can freeze it and use it for more pizzas or pasta. 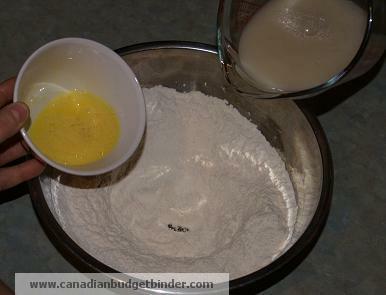 In your measuring cup empty the envelope of yeast, add in the sugar and warm water then mix. 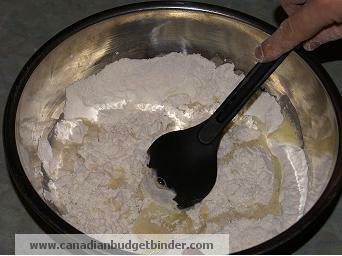 In a large bowl add the flour and salt then make a well in the middle. Once mixed, turn onto a floured surface and knead until the dough is smooth and elastic about 5-7 minutes Note: do not use too much bench flour just enough so the dough does not stick to your surface. Lightly coat a large bowl with extra virgin olive oil, then put your dough inside. Put your pizza dough on top, add the sauce and your ingredients Put the pizza in the oven for about 10-15 minutes depending on your oven.. The Saturday Weekend Review #2 January 2013 KFC, KFB No, It’s KFK! I’ve been making my own pizza for some time using frozen crust. Looking at yours inspires me to make my own crust from now on. I LOVE making my own pizzas, there is a certain satisfaction from making it yourself from scratch and knowing exactly what is in it. We have been making homemade pizza in my house for years. We usually make 3 pizzas at a time (2 large cookie sheets and a round pan) and it gets eaten very quickly. We are NOT traditionalists when it comes to our pizza though and, for example, make cheeseburger pizza (sauce base is ketchup, followed by cooked ground beef, onions, mushrooms and topped with sharp cheddar) as well as a number of other types. It is far better than takeout and always a winner with the starving kiddoes. I love some pizza. I especially enjoy good, quality homemade pizza. Nice recipe Mr. CBB! 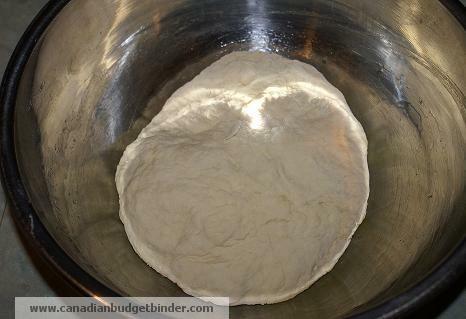 We haven’t bought a frozen pizza in several months, but do use a store bought pizza dough mix. It is already much better than the cardboard variety. Baby steps, right? Maybe I’ll work up the nerve to try this one. It looks wonderful. Pizza is usually one thing I can get my picky eating daughter to eat, although with just cheese on it. I am not too picky when it comes to pizza toppings, I like pepperoni, bacon, ham, sausage and any vegetable such as mushrooms, green and red peppers, onions, broccoli, etc. I have one more frozen pizza in the freezer which I bought with a coupon, once that one is gone I am going to make the next one using your recipe. Thanks for sharing! Looks delicious Mr CBB! Homemade pizza is a weekly tradition at our house. I make 3-4 pizza dough and freeze them. My recipe doesn’t include an egg though. And no rolling pin around here, a bottle of wine does the job :). I wish I had the skills to throw the dough in the air and get a thin crust but so far the consistence of the dough doesn’t allow it, will have to play with the proportions, maybe add more water to make a softer dough. Thanks for sharing! My daughter loves pizza my boys love calzones. So this is a win win for us. Plus it gets them helping with dinner and they tend to eat more! You however, have given me some great ideas! Thanks Lynn, this pizza was awesome. The calzone I layered sauce, onion, slices of cream cheese and ham… WOW! Brush the top with extra virgin olive oil before it goes in the oven. Needless to say we don’t want pizza for a while now. It was more for lunch than dinner though most times. Cheers Mary! Oh man. That looks amazing ! It was 4 times over… lol.. creating food is fun! !